Heat oven to 350 degrees F. Mix graham cracker crumbs, sugar and butter. Press mixture firmly and evenly against bottom and side of 9-inch pie plate. Bake for 8 to 10 minutes until just browned. Cool before adding filling. In a medium saucepan blend sugar, cornstarch, water, butter and lemon juice over medium heat. Stir with a wire whip just until butter melts and mixture is smooth. Add 1/2 cup blueberries and stir constantly until thick and syrupy. Remove from heat and fold in 1-1/2 cups blueberries. Set aside to cool. Spread cooled filling over bottom and sides of cooled pie shell. Spread whipped topping over filling leaving about 1-inch of the blueberry filling uncovered around the edges of the pie. 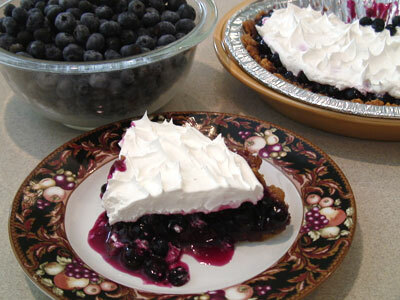 Place 5 to 10 blueberries in the center of the pie for the final touch.